The Windsor Hills Home “Discover the Magic” is located only ** 2 Miles ** from Disney's Main Gate. Within 1 mile of our Windsor Hills villa lies a vast sea of shops, supermarkets, stores, entertainment, and activities. The Windsor Hills Resort community is a 24 Hour Secure Gated and manned community for your peace of mind. Indulge in Disney's Most Extravagant Resort with Superior Amenities at Windsor Hills Resort. Make our home your Disney's most luxurious stay. It will truly be one vacation you will enjoy and remember for years! The 5 Bedroom/5 Bath vacation home has a South/Southwest facing private pool and hot spa with extended pool deck for your sunbathing and relaxing pleasure. When heated, the hot spa heats up to about 100 degrees Fahrenheit/38 degrees Celsius. -	Bedrooms on main level; ensuite King, ensuite Queen, and a set of twins. -	Bedrooms on the upper level; a king and a set of twins. -	There are 5 full bathrooms in the house. Kitchen is fully stocked with pots, pans, cookie sheets, crock pot, coffee maker, toaster, etc. All lines are provided; towels, sheets, pool towels, etc. One of the best things about this Windsor Hills Resort community is that it is so close to Disney at 2 Miles Away! Its location is very close to shops, stores, restaurants and a myriad of activities and entertainment. If you enjoy a game of golf, there is a championship golf course less than a mile away. While vacationing, you can be rest assured that if you need any additional information or assistance, you can call our 1-800 management company 24 Hours of the day. Staying at our vacation home in Windsor Hills Resort will be a vacationing experience you will Never Forget! If you would like to add the pool/hot spa heating option it is an additional $25 per night. Hi - we bought the vacation home after a trip to Disney World with our children. They LOVED it so much we knew we would be back very often. All 3 of our energetic and crazy kids love Disney and Florida. We wanted a warm, comfortable and fun place for our family to go and relax. We hope you enjoy the house as much as our children have. There are 3 bedrooms on the first level. At the Windsor Hills club house. BIG Screen 52" TV, 5 Cable TVs, 4 VCRs, 4 DVD/MP3/CD Players, Personal Computer with Wireless Internet Access FREE!, Central Air Conditioning/Heating, Private South/Southwest Pool and Raised Hot Spa on Extended Deck, Luxurious water park pool with fountains, Waterslides, Separate Hot spa, Separate toddler pool, DOUBLE Olympic Size Swimming Pool and Sandy Beach, Tiki Bar, BBQ gazebo, State of the art Movie Theatre - High Definition Surround Sound, Tennis courts, Volleyball courts, Children's Playground, Billiards tables, Video arcade room, Fitness room with top of the line fitness equipment, Sundry Shop, Fully equipped kitchen, Microwave oven, toaster, blender, electric can opener, cheese grater, Cooking utensils and equipments provided, Bed and Bath Linens provided, Telephone with unlimited local calling FREE! Owners were very pleasant to work with. House was beautiful and the perfect size for my family. 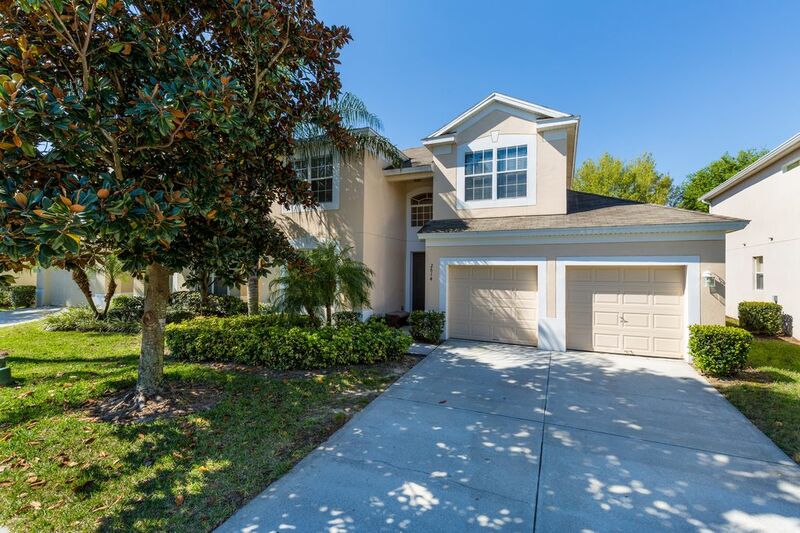 Close to Disney and we love the gated community that it is. Thank you. Perfect house for large families. Any questions or concerns that came up Ann Marie was more than helpful. Super close to Disney and the super center Walmart. My family, including my husband, 3 kids and my parents, stayed here in February. It was absolutely perfect! We had more than enough space for all of us. We loved the outdoor seating around the pool. Location was ideal being close to Disney and we loved having the extra things to do within the resort on our off days. Highly recommended this house for any family! Everything was as advertised... no issues, no stress... exactly what one would want on a vacation! The home is absolutely perfect. There was plenty of room for everyone, and lots to do. They included even ping pong and foosball in the garage. Nice touch. The pool was warm and cozy for relaxing in after a hard day at Disney. We couldn't have asked for anything more. The proximity to Disney was absolutely perfect and it was so convenient to have a Walmart on the way. Would highly recommend it for a large family and if I ever have the courage to do Disney again I would want to do it from this Homebase. Check-in and check-out was super easy making the end of a long trip much less stressful as well. Great house! thank you so much! Great location. Comfortable layout. Handled our group of 8 very nicely. Owner was very receptive and quick to respond to all of our questions and concerns. Pool/Hot spa heating is an additional $25 per night plus 13% Florida tax. Please let us know if you would like to add this option to your rental.